Practical strategies for sustainable living can help Mississippians save money, increase independence and benefit the environment. "After the widespread power outages this spring, people have a new interest in ’living off the grid’ or reducing their energy consumption," Melby said. Melby teaches his students multiple ways to design energy-efficient buildings based on his research and experience. He worked with mechanical engineers and architects to design and build The Citizens Bank of Philadelphia branch in Starkville and MSU’s three landscape architecture and landscape contracting buildings. Some energy-saving strategies used in new buildings can be applied to existing homes. In the southeast United States, air conditioners account for two-thirds of the heating and cooling portion of the energy bill. But there are ways to stay cool for less money during the hotter months. "Use a dehumidifier," Melby said. "If you cut the humidity indoors from 70 to 50 percent, you’ll feel 8 to 10 degrees cooler, even though the thermostat reading doesn’t change. You’ll also reduce mold growth in your house, as mold grows at 50 percent humidity and higher." With new construction, considering energy efficient strategies can save money over time. 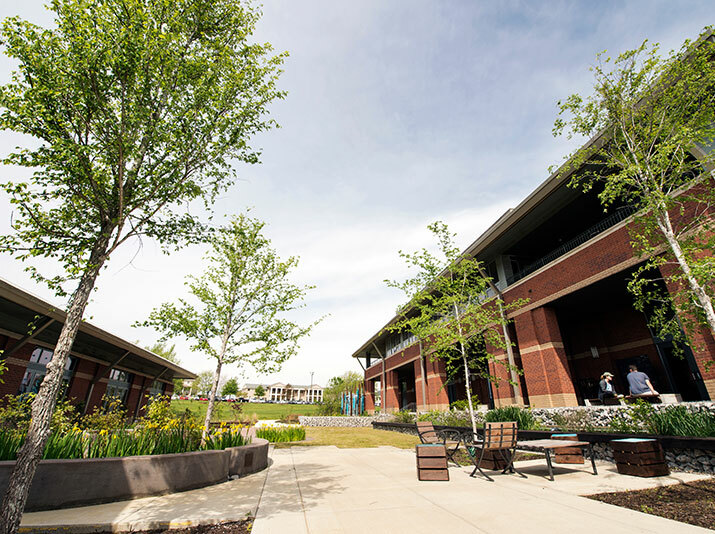 "When designing new buildings, we’ve learned how to incorporate a variety of energy-saving features, such as using a rectangular building with the long axis facing south, south-side overhangs to block summer sunlight and tree planting on east and west sides to reduce the amount of kilowatt-hours used per year. "With careful design and the use of solar panels, homes can meet the required energy load without relying on an outside power source," he said. Melby has developed other strategies for more self-sufficient living, including home food production gardening. By working with Sylvia Byrd, associate professor in MSU’s Department of Food Science, Nutrition and Health Promotion, and MSU biologist Armando de la Cruz, Melby created a chart and online calculator to help families plan raised-bed gardens. These gardens can produce enough fruits and vegetables to feed a family of four people the minimum U.S. Department of Agriculture recommended five daily servings, year-round. "In our hot, humid climate zone, three different gardens can be planted in a year, one each in spring, summer, and fall," Melby said. "Harvest time also means canning, freezing and drying produce to eat during the winter months. Families that grow their own fruits and vegetables will have a high-quality, locally grown food supply, which will increase health, reduce cost and decrease reliance on outside food sources." Rain water runoff harvested from the house into a rain barrel or cistern benefits vegetation and the environment, said Tom Cathcart, ecological engineering professor in MSU’s Biological Engineering program. "Plants are watered with chlorine-free water, and the water that fills a rain barrel tends to be the first wash off the roof," Cathcart said. "Known as the ’first flush’ because it is the dirtiest of the runoff, this water is filled with all sorts of things that plants love and that does not need to make its way out into the street. Rain barrels are environmentally useful." Depending on the size of the garden, more than one rain barrel may be needed to capture enough runoff to water plants consistently without supplementing the supply with tap water. While water is currently not expensive enough to immediately offset the investment in rain barrels and hardware, many people like the idea of capturing this free resource instead of paying for it. To read about Melby’s ideas, including 30 ways to save energy when building a new home, visit www.energyusereduction.com.